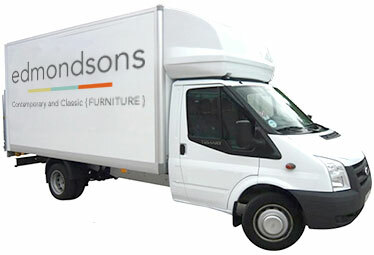 Here at Edmondsons we have our own trained and experienced delivery team, who will safely deliver your new purchase to your home. They will consider access to where the goods are going to sit, placing blankets and protective covering where necessary. Any required assembly is undertaken and may take time, as we do not like to rush delivery. Packaging is taken away for recycling, leaving your room tidy. A little more time may be needed if doors need to be removed as part of delivery, to get larger items into your home. Should a window removal be required, this can be arranged upon request with a third party window specialist who works alongside our team with a price on application. Once we have delivered and installed your purchase, you will be asked to inspect and sign as received in good condition. The invoice and any relevant guarantees and documents will be left with you to keep. When your furniture comes into stock, one of our friendly staff will contact you to say that we have received your goods and will arrange a convenient delivery date with you. We offer Monday to Friday AM or PM delivery, but can offer a more specific time window if so desired upon request. We ask for all goods to be paid for in full before delivery, which is free within a 50 mile radius but deliveries beyond this can be serviced for a price per mile after agreement.